HAARP Science Or Natural Phenomenon? The complete magnetometer data is posted below the following updates. Update: After many weeks of being missing, many magnetometer sites are now back online, however, they are back with missing data. Update: It appears that many magnetic observation stations are mysteriously inaccessible. 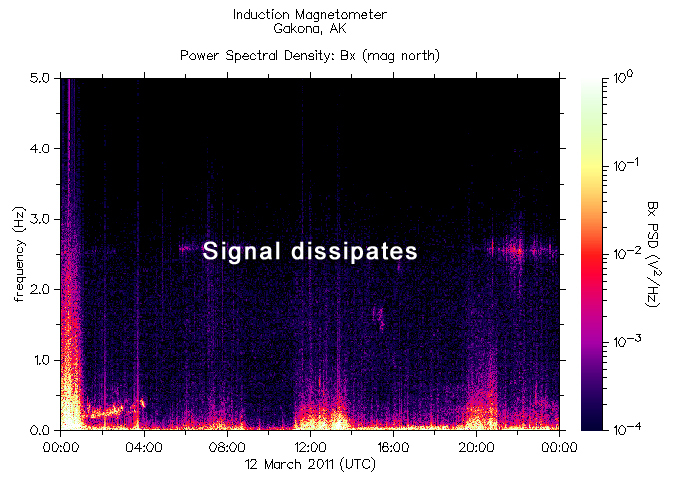 The Kiruna Magnetic research page will only show data from April 3rd, but nothing recent. NewsFocus cannot retrieve data from the UCLA ground magnetometers either. We are currently checking all known world magnetic research sites. More info to come. Update: After a 7.4 Japan quake, and a 4.0 Greenbrier, AR quake on Thursday, April 7th, the HAARP data page has strangely enough been blocked, or temporarily pulled. The timing of this "glitch" is highly questionable. 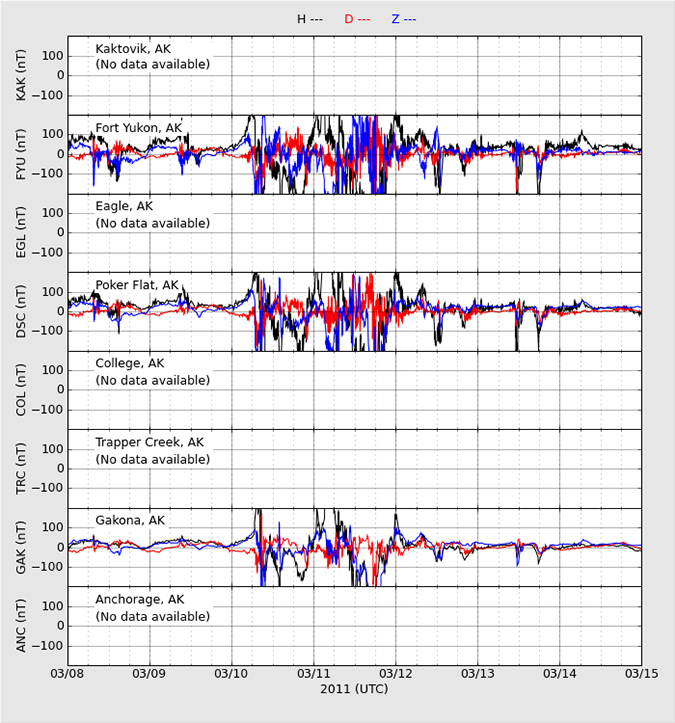 With all of the myriad allegations floating about HAARP and earthquakes, this gives the impression that data is now being hidden, or possibly doctored until it can be put back up. To see this happen in conjunction with these already highly questionable quake areas is extremely disconcerting, to say the least. Why not just post an explanation and thus challenge those making claims of a HAARP connection? To just pull the site gives the wrong impression at a time when many are concerned about the possibility of "eco-weaponry" in the wrong hands. 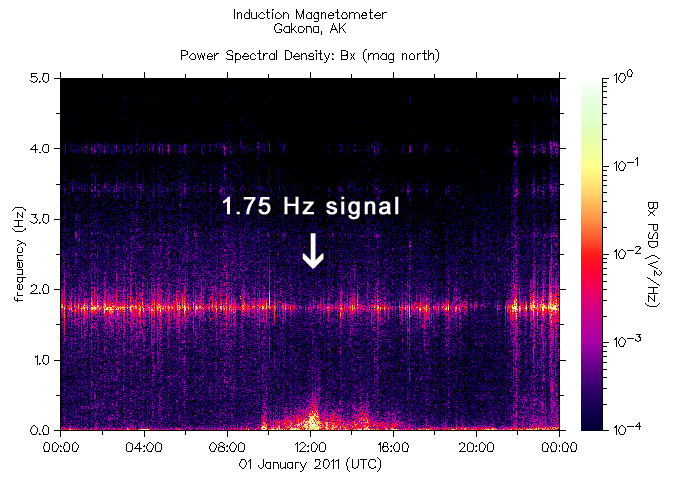 The following magnetometer readings come from the official HAARP website. The mysterious 'coincidence' of these readings with the following events is indeed curious and begs for more study. 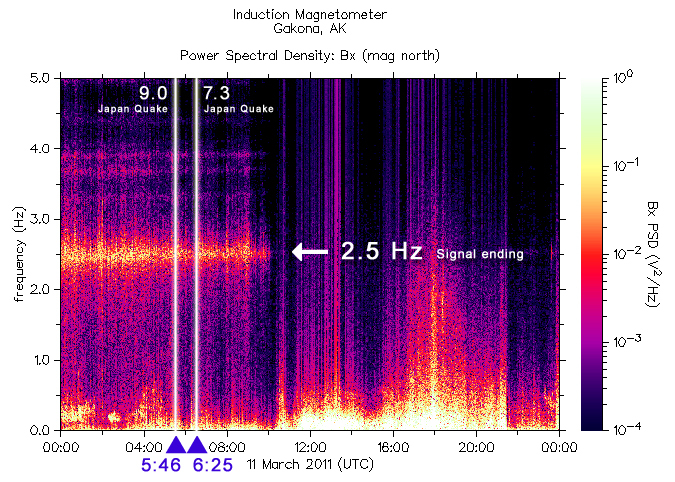 While many claim that the Gakona magnetometer data is definitive proof of HAARP, or other advanced technology, this website prefers simply to offer the data for independent review as we seek a suitable explanation for this mysterious correlation. 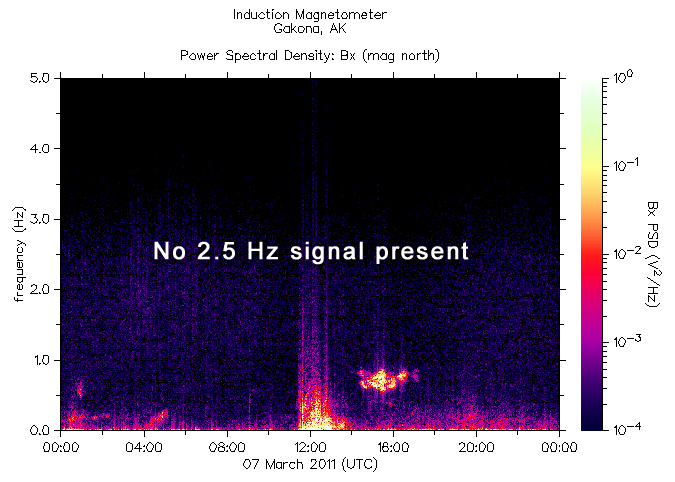 Is it a piezoelectric effect, or perhaps solar activity? NewsFocus has contacted many science professionals in seeking the answer to this question. We will publish all respectable explanations as they come forward. The first Japan earthquake was a 7.3 on March 9th. The big 9.0 quake was on March 11th. 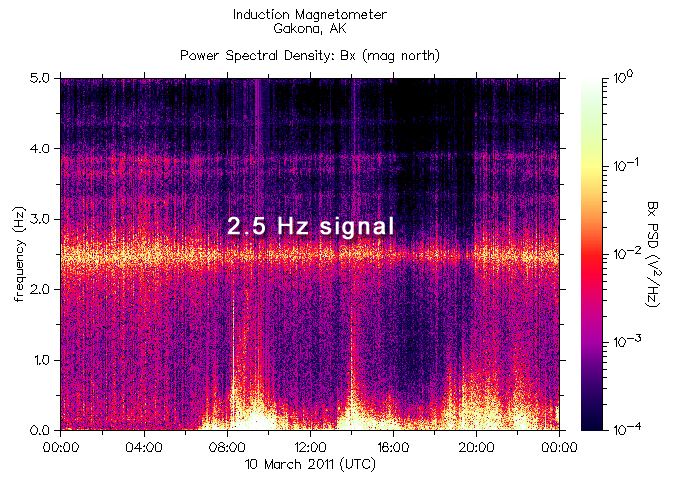 The coincidence of this alleged HAARP signature showing up three hours before the first quake and ending roughly three hours after the second is indeed quite strange. A natural phenomenon picked up at Gakona, Alaska, or technology gone awry? This timeline starts with 03/05 through 03/16. 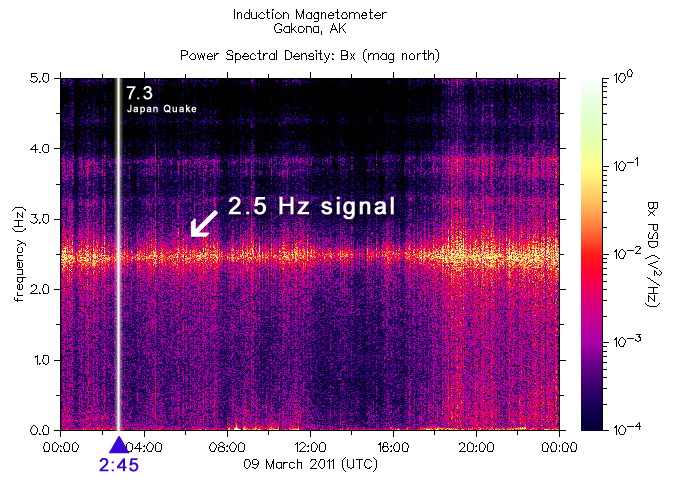 The alleged HAARP signature shows up just before the 7.3 quake and ends just after 9.0 quake. It is most curious that this 2.5 Hz anomaly begins just before the 7.3 Japan quake on March 9th and ends just after the earthquake on March 11th. The timing is indeed uncanny and strange. While this magnetometer chain does not precisely match, we offer it in the interest of fair data to be considered in studying this anomaly. 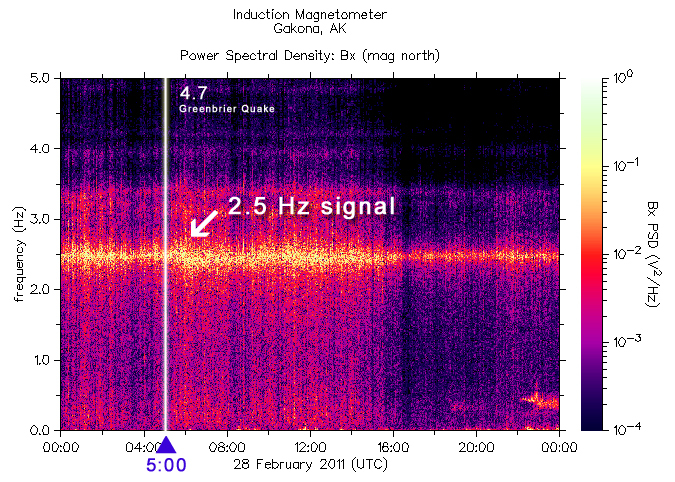 This mysterious 2.5 Hz signal also showed up on February 27, 28 and 29 before vanishing again. The mystery signal, although lower in frequency, was present just before New Years Eve, into New Years, and once again disappearing quickly the next day. 5,000 dead birds fell from the sky on New Years Eve over Beebe, Arkansas, next door to newly quake prone Greenbrier.